Chick-fil-A and Whataburger didn't make the top spot in certain states ... so what did? Chick-fil-A might be America's favorite fast food restaurant, but Texans and Californias are up in arms about their states' supposed favorites in an old poll that has since gone viral. Last November, a survey was conducted to determine the country's favorite fast food restaurants from state to state. The list was published by Business Insider with data collected from Foursquare (determining popularity by the number of visits and locations in each state). But on Friday, the map resurfaced on Twitter and has been causing an uproar, and even vehement disgust, among the masses. Chick-fil-A, which has locations in most states, dominated the Foursquare map, but the most unsettling results (at least for the locals) were in California and Texas. 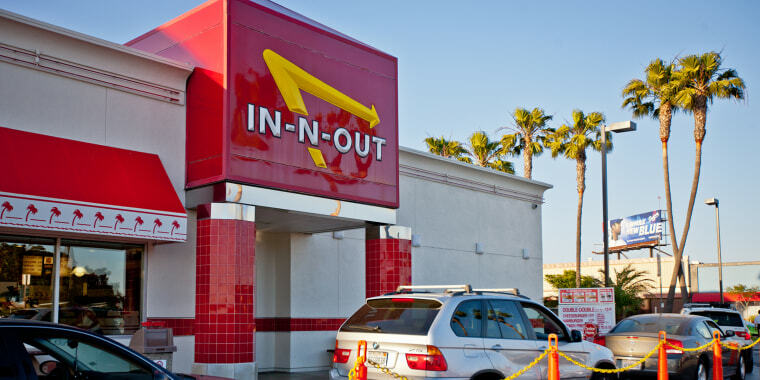 In-N-Out Burger is loved by most residents in the iconic burger joint's founding state — including celebrity chefs like Guy Fieri, Gordon Ramsay and Ina Garten. And yet, the small, Louisiana-based Raising Canes (which is known for its chicken fingers) nabbed the top spot. But In-N-Out Burger did win Texas ... and burger lovers in Texas, home to the regionally-favored Whataburger chain, were not happy. Let's just say, two of the country's biggest states are having minor meltdowns across social media right now. I've lived in LA my entire life and never even HEARD of Cane's. Some were surprised at the overwhelming amount of Chick-fil-A allegiance by state (have you tried that sauce, though?!) and wrote, "Who the heck is Canes?" But Texans were perhaps the most outraged. "Would you look at this?" one tweeted at Whataburger with a meme. Another called the poll's results "disrespectful" to Texans. Texas would be Whataburger. I've never even been to In N Out. You got Texas wrong. Who did this survey? What an insult to Texans. With many tweeters calling out the inaccuracy of the survey, one questioned whether people even use Foursquare. Take it easy, folks, it's just fast food. While states like California may be booming with In-N-Outs and Whataburgers, the survey stated that the people who go to the winning fast food restaurants "go a lot," and therefore put the chains with just a handful of locations on the map ... literally.